Joshu Kaneiye tsuba styled with Aizu Shoami school features. This classical theme shows the 'fisherman in a boat' (Kaneiye) and the scene of reeds, water, and the rest is with Aizu Shoami school influence. The reverse is Aizu Shoami school influence work. "Did Kaneie have a family name? If so what might it have been, and why did they not use such an important status symbol? It is interesting speculation on my part that it might have been SHOAMI, which even at this early date was so common that they did not need to employ it. This excerpt taken from Robert E. Haynes paper titled 'Colloquies Concerning Kaneie of Fushimi'. The following are generally found features in both Kaneiye and Aizu Shoami tsuba. Aizu Shoami tsuba mostly have an iron ji, and kinko works are very rare. Also, both hitsu-ana are often shaped like kogai-hitsu as opposed to this Kaneiye tsuba having the standard kozuka-hitsu and kogai-hitsu configuration. A motif showing a person or thematic object with a natural landscape in the background is common for both Kaneiye and Aizu Shoami. 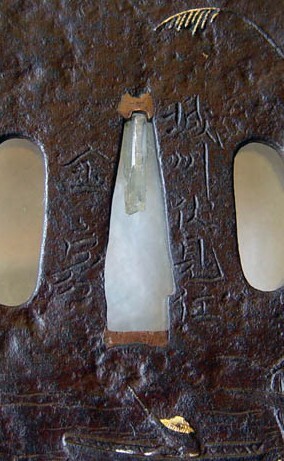 The iron ji can be encountered in several varieties. This Kaneiye is 2.5mm thick and has a dark brown patina and strong variations in the surface. This type of ji is often highly tempered. There are earlier Kaneiye tsuba with very thin ji (less than 2.0mm), and appear polished with a chocolate brown patina. The later Kaneiye tsuba are around 3.0mm thick and have a rich purple-black patina with variations in the surface making it appear rough. The first Shodai Kaneiye was the original designer and a superb craftsman. It appears that he must have descended from one of the Katchushi schools. His work is generally a large circular or mokko tsuba with uchikaeshi mimi in well forged iron with tsuchime. Human figures and so forth are on the surface in taka-bori. There are varying amounts of zogan, the design being simple but classical. Each facet of his work, after examination, will be found to be finer than anything the past had to offer. The left image is the HAYNES/MOSLE tsuba Mei, the right image is the KANEIYE / AIZU SHOAMI-FU tsuba Mei. The tsuba or sword guard appeals in a peculiar way to the lover of Japanese art, perhaps in part because it touches Japanese manners and mind, history and religion more intimately and more attractively than any other type of object with which one is apt to come in contact. It may be safely said that sword guards examined in private collections in foreign countries are by no means the sword guards which one sees in Japan, under similar conditions. The Japanese collectors who envelop their tsuba in soft old brocade, and tuck them away in exquisite lacquered cases, have usually but few examples, perhaps not more than a dozen in all, but each is of delightful quality and represents fairly the pick of picked specimens. The Japanese connoisseur is not the man to allow an important guard to find its way into trade. In fact, when a really good sword guard is for sale, it is apt to be taken immediately by a local personage, for he it is who will pay the price for it, and not the foreign buyers, and it is he, therefore, who is always given the first choice by merchants from one end of the country to the other. It is difficult to appreciate the love for a beautiful sword guard which was felt by a samurai of the old school. Its form delighted him and its color; its patina soothed him, and he touched its soft sur-face constantly and gently. Perhaps its design suggested some deed of Japanese chivalry which made this guard a fitting setting for an historic blade. Naturally, therefore, samurai, who represented a large and influential class, patronized the makers of tsuba, and from this general patronage arose and flourished schools of artists some of whose names persisted for cen-turies, some but for two or three genera-tions, each distinctive, however, and pro-ducing objects which form in themselves an attractive theme for study -a theme no less attractive, perhaps, because involved and difficult. Indeed, it would be quite un-wise for anyone to attempt to understand the sword guards of Japan from the view-point of many schools and many makers, as one is often tempted to do when living out-side of Japan: 'tis puzzling enough in tsuba to study a single problem intensively. Nothing, in fact, has given the present writer a better insight into the difficulties which beset a student of Japanese art (for from one case of this kind we may learn all) than his experience collecting and studying the work of a single family of sword guard artists, trying by the method of comparison to distinguish among all available specimens the good tsuba from the bad. To this particular study he had been led by seeing an iron guard which seemed to embody many distinctive features of Japanese art. 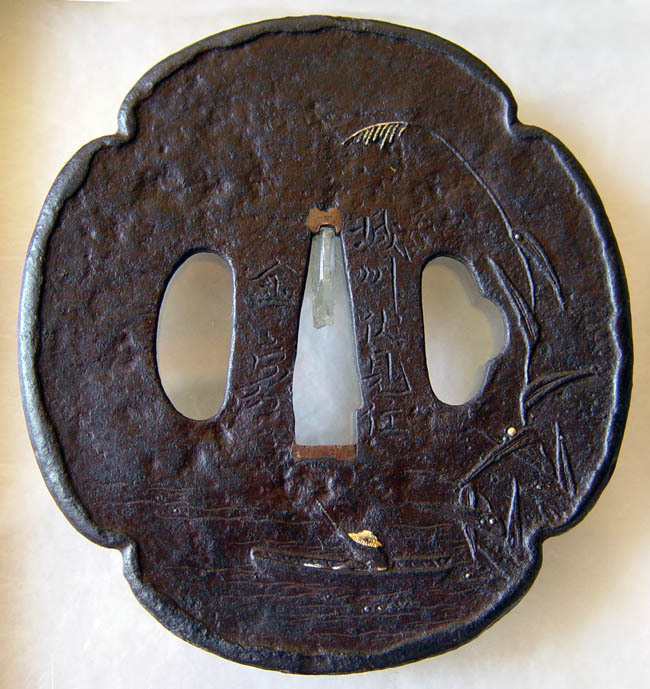 This tsuba was of iron, simple, of beautiful brown patina: it was executed in low sculptured relief, and pictured a scene. The bottom right section contains the main design, a classical theme of a 'fisherman in a boat' and the scene of reeds and water. The reverse is reeds and water in bottom left section. Carved in takabori and/or detailed with nunome or inlay work, while the upper left section background area is carved with comparatively less detail - more soft and suggestive. This effect nicely implies visual distance, draws our eye to the main section of the work and gives the illusion of depth to the overall design. It is common to see small details in gold (kin) inlay with all Kaneiye works. Now the art of the guard lay in this, that the man seemed living, executed boldly though crudely, apparently by but a few strokes. It was clear that he concentrated heavily on his fishing pole, that the figure was tense, yet moving, and that the boat itself buoyantly was still on the water. Even at first view, this guard made a deep impression, as it was clearly the work of a master, and his name, according to the signature, was a certain Kaneiye who lived in Fushimi in Joshu. Now in general, in foreign countries, a Kaneiye guard is a Kaneiye guard, for better or for worse, and the collector is apt to place it in his series and catalogue it as the work of the artist whose name it bears. In Japan, on the other hand, a Kaneiye guard is a Kaneiye guard only when it possesses the definite characteristics and traditions of one of the members of this great family. In fact, it need not be signed, for in many cases the signatures are of considerably later date than the guard. The reason of this is not far to seek. It appears that the Kaneiye artists were men of great renown in their day, and that their work passed into the hands only of distinguished personages and connoisseurs. 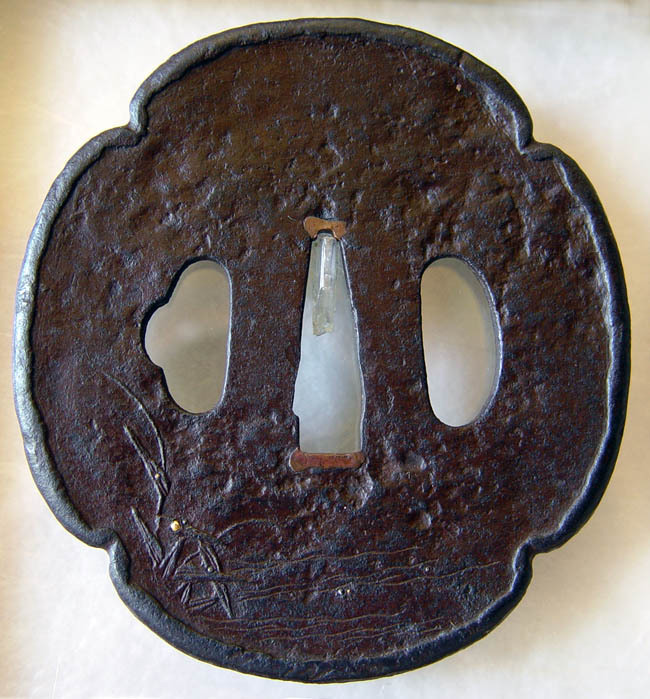 On this account, in part, their tsuba were especially coveted far and wide. Hence numerous copies were made in various parts of Japan and by artists of many grades of merit. And it is these replicas or variants, naturally, which one finds to-day in commerce. As far as the history of the Kaneive goes, early records are vague. In general, however, the work is known of three generations of their name. The first generation appears to have flourished during the last quarter of the sixteenth century, the second generation roundly from 1600 to I650, and the third generation from the middle to the end of the seventeenth century. 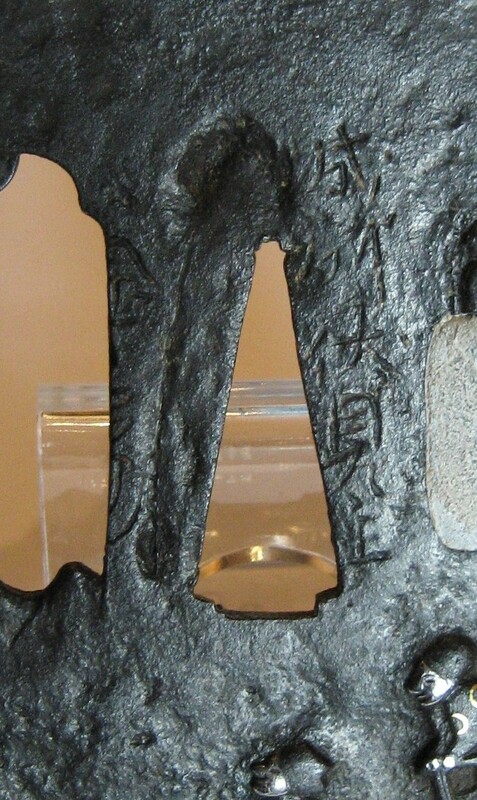 The great number of the “Kaneiye tsuba" are clearly of eighteenth century workman-ship. In a general way the first generation (Sho-dai) executed iron guards with four marginal indentations and decorated with personages. Of the latter, the faces, arms, and ornaments are apt to be executed in precious metals, while other parts of the figures are sculptured out of the substance of the guard, and in sharp relief, i. e., they do not "round" into the background, and the sculpturing is simple, with a suspicion of Chinese workmanship, and singularly effective. The themes are classical, often religious or historical, usually treated naively and nearly always so as to suggest darkness and mystery. The second generation of Kaneiye (Ni-dai) produced guards of somewhat flatter relief, of better metal, always thin in the region where the guard is pierced by the sword blade and typi-cally finished along the border with an irregular line, which simulates a folding over of the metal. The themes, drawn from folk-lore, poetry, and philosophy, are delicately modeled, usually in low, flattish relief, and are always developed with masterly simplicity. By Japanese experts the work of the second generation is considered the best. Kaneiye Third (San-dai) prepared guards which were disc-shaped and somewhat heavy, of iron of the best quality, taking usually a satin-like patina: his favorite themes were birds and plants, especially bamboo, treated in low relief simply, but with great artistic judgment. A single bird, and a small one at that, and a single spray of leaves, were all that this master was apt to use in a composition. In this attribution, one would lay stress on the character of its execution - its roughly treated margins, its bold relief, and its greater weight. It retains, also, the delicate black scales at various points of the guard, suggesting that it was at one time covered with lacquer. These scales, so far as the writer knows, occur only in the authentic works of the first generation. In its theme, too, it is typical of the earliest generation.